Some believe Christmas buzz begins too early. I say: impossible. Why not maximize the most cozy, festive, joyous, wonderful time of the year?! With its twinkling pine branches and rows of decorated wooden huts, Vancouver’s annual Christmas Market gave nuts like myself a chance to dive into the spirit as early as November 24. Head over to downtown’s holiday haven where you’ll find German bratwurst, Bavarian Leberkaes (meatloaf), Swiss Raclette, and more. My diverse lunch began at ‘Das Deutsche Nudel Haus’ with schupfnudeln — a dense hand-rolled German noodle with a gnocchi-like texture. Fried in a massive pan with sauerkraut and bacon, this filling entree will satisfy any salt and sour loving palette. 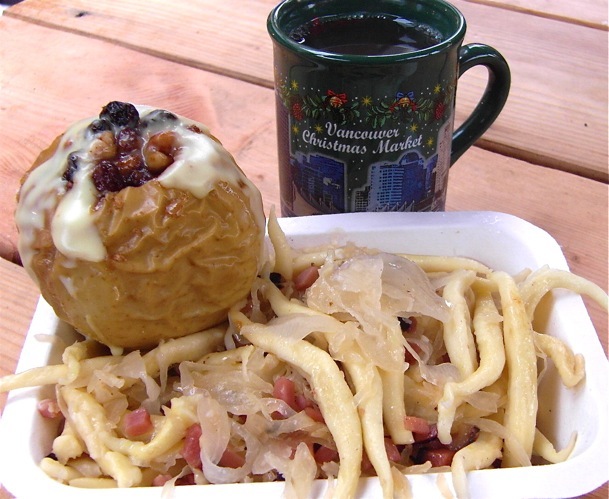 For dessert, try a baked apple, from ‘Das Apfelhaus’, filled with sugary walnuts and raisins. A warm drizzle of creamy vanilla sauce is a perfect finish. Unless a tiny mug of mulled wine ($4) satisfies you, I’d go for a cup of drinking chocolate. For weekly lunch ideas, follow me on Twitter.